It was a warm night in Toronto, and Lee’s Palace was going to turn up the heat. Agent Orange, a surf punk band from Placentia, California just hit the stage and opened up with a short taste of the sound with an instrumental. This was not the only short song on their list. It seems that this punk outfit played hard and fast 2 minutes at a time. The lead singer Mike Palm told us of him shattering his wrist, from a skateboarding accident, from one of his Agent Orange skateboards. Nice plug Mike. That did not stop Mike, he rocked it out like a trooper. You would never know how bad his injury was. Unfortunately, the sound man kept Mike’s vocals on the quiet side for the first part of the set. It didn’t matter though because this band was playing hard and fast to keep the audience in a solid mood. These guys know how to keep the party spirit alive. Their sounds took us to South America and then hit us with a track that sounded like something from Iron Maiden’s first album. Mike changed guitars and its name was URGH Loud One. With that said we went surfing once again and the waves were high and mighty. This classic, legendary Punk band could have satisfied Toronto’s crowd that night, but we still had one more amazing band. Unfortunately, it was not going to be Flat Duo Jets. They were stopped at the border and was not allowed in Canada. This did place the energy of the situation down. I met a father and son team that flew in from Calgary to see Flat Duo Jets, and I read some online disappointment from other fans that really wanted to be there just for this band. The father/son team made me promise to watch a video of this band and after I got home I YouTubed it. I must admit I am now disappointed because these guys would have added a new dimension of awesomeness to the whole experience. With that said it was time to go to church, and the Reverend did not disappoint. 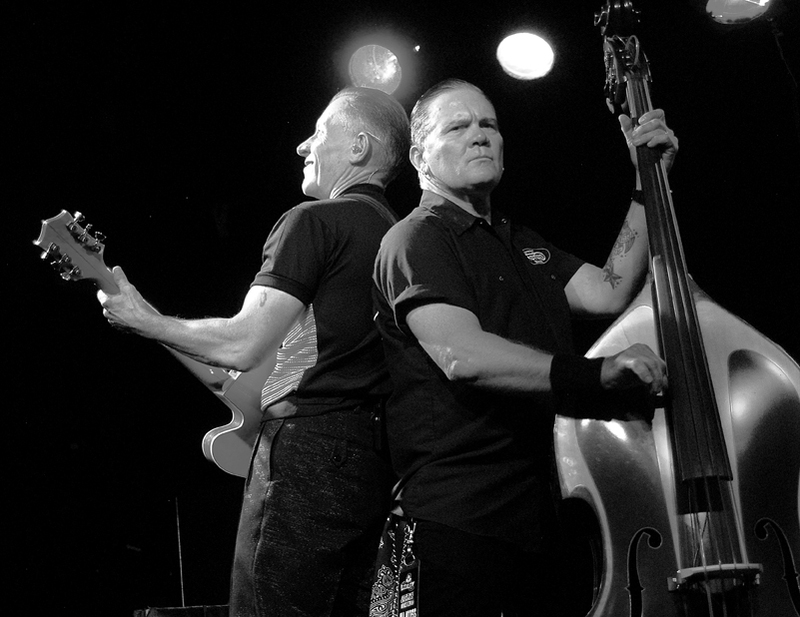 Reverend Horton Heat, from Dallas Texas, took the stage and began an exorcism to drive the devils wild. His blistering Rock and Roll started in your ears and went straight through your body and out your toes. Fellow Bass player, Jimbo Wallace can really Slappa da Bass. There was a great story of Jimbo during a song called Psychobilly Freakout, where Jimbo was slapping dat Bass soooo hard that the strings broke but he kept on playing. He eventually cut open his hand and there was blood being spilled all over the place. Good times. Scott Churilla was on drums, and boy could that guy plow his way through a party. He even threw in a drum solo that I am now kicking myself; I should have taped it for you loyal readers. What I loved about this experience is The Reverend seemed to be a Maestro hosting one hell of a party. The audience, that packed Lee’s Palace, looked like they were in the church of rock at Mardi Gras. There were some people that looked like they were in voodoo trance or possibly surfing with zombies. The band is not about showing off flashiness, but being down and dirty. That is where their flash was being shown off; their raw talent and the reaction of the crowd. At one point the Reverend and Jimbo switched instruments and Jimbo got to show off his Chuck Berry skills. They went into a song called “In your wildest dreams”. It was a slow haunting but lovely song that if you were there with your girl, you may be swaying on the dance floor. I never knew this but the Reverend and Lemmy Kilminster from Motorhead knew each other. He spoke very fondly of him. Lemmy use to go out and see every band he could, because of his love for music. I did not know that, but I can see him do stuff like that. So The Rev took us on a little tribute ride and blasted out, “Ace of Spades”, by Motorhead. Well being a big Motorhead fan myself, that was the icing on the cake for me.